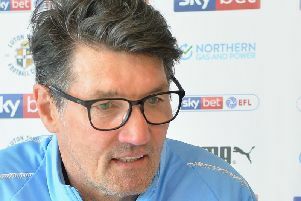 Hatters boss Mick Harford was eager to give all the credit to the players after his side equalled more club records by winning 2-1 at Bristol Rovers on Saturday. The result saw Town up to 27 league games unbeaten, the second time they have managed such a feat in their history, with the record being set during the Conference winning campaign of 2013-14. It was also the 13th away league game without defeat, a feat achieved on their way to promotion from League Two, between August 26, 2017 and December 26, 2017. Finally, it equalled the number of League One games unbeaten, set by Bristol Rovers themselves. Harford himself is now responsible for 14 of the unbeaten matches, winning 10 and drawing four, as previous boss Nathan Jones oversaw 10 wins and three draws, as the boss said: “I’m just going to pass the accolades on to the players as they’re the ones who deserve it, they’re the ones who perform to the high levels they’ve been performing. “This club has had some great teams, great players and they deserve to be definitely amongst that top lot, the players, in terms of the records they’re breaking. "So well done to the players on my behalf and I just want to say thanks to the fans as well. "They come in their numbers, week in week out and they were down that bottom end and they’re contributing. Full back James Justin who had been at the club when they set the record the first time around, said: “I was in the youth team, but I was never really getting a sniff as I was 16 at the time. "It’s just amazing what we’ve done and a credit to everyone in the team, as everyone who steps in just keeps the standards up. "Hopefully we can go and continue it until the end of the season." Meanwhile, striker James Collins, who has scored 17 goals in the unbeaten sequence, added: "I think records come along with performances and results. "It’s great to keep winning these games and be 27 unbeaten, but the main aim is to get promoted and the only way you’re going to get promoted is by winning games. "The lads are focused on winning every game and then the records come with it."